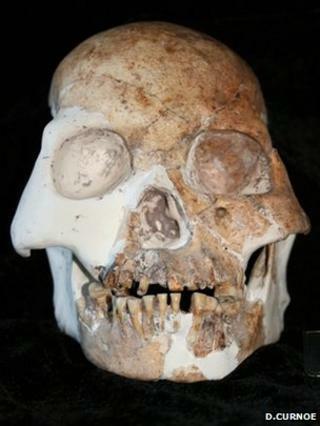 The team has told thePLoS One journalthat far more detailed analysis of the fossils is required before they can be ascribed to a new human lineage. One posits that they represent a very early migration of a primitive-lookingHomo sapiensthat lived separately from other forms in Asia before dying out. Another possibility contends that they were indeed a distinctHomospecies that evolved in Asia and lived alongside our own kind until remarkably recently. "It's possible these were modern humans who inter-mixed or bred with archaic humans that were around at the time," explained Dr Isabelle De Groote, a palaeoanthropologist from London's Natural History Museum. "The other option is that they evolved these more primitive features independently because of genetic drift or isolation, or in a response to an environmental pressure such as climate." Dr Curnoe agreed all this was "certainly possible". Attempts are being made to extract DNA from the remains. This could yield information about interbreeding, just as genetic studies have on the closely related human species - the Neanderthals and an enigmatic group of people from Siberia known as the Denisovans. Whatever their true place in theHomofamily tree, the Red Deer People are an important find simply because of the dearth of well dated, well described specimens from this part of the world. "The Red Deer People were living at what was a really interesting time in China, during what we call the epipalaeolithic or the end of the Stone Age," says Dr Curnoe. "Not far from Longlin, there are quite well known archaeological sites where some of the very earliest evidence for the epipalaeolithic in East Asia has been found. "These were occupied by very modern looking people who are already starting to make ceramics - pottery - to store food. And they're already harvesting from the landscape wild rice. There was an economic transition going on from full-blown foraging and gathering towards agriculture."